One last step.....Complete your waiver! For each friend you invite to join you on this trip, we will give you a 10% of what you paid back in the form of a credit coupon which you can redeem against the cost of a future booking with us. Simply email us your friends names before they book so we can apply the credit vouchers to your account. Help bring us like-minded guys together from all of the world and to build new meaningful friendships. Provide a platform and support group for our members who are looking to challenge themselves in new ways, who are looking to overcome hardships in life and/or to challenge any fears/phobias which have held them back in the past. Provide a safe place where members can embrace their true selves without judgement. Provide beginner level adventure travel experiences for our members that feel completely removed from the material world. No negative news, no emails, no radio, no cell phones etc. The goal is to achieve a complete sense of solitude away from the daily drain of the material world. This is a time to self-reflect, grow, set new goals, give back to the community and learn from those around you. And we'd love for you to join our community. 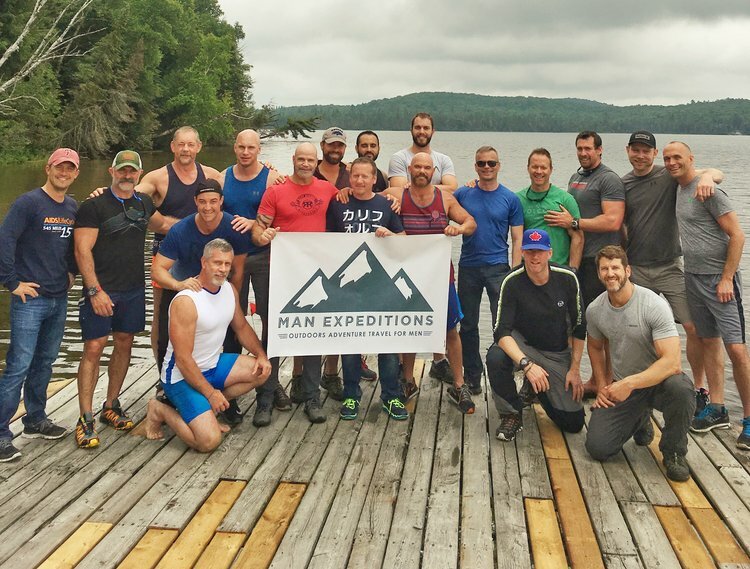 Man Expeditions & Tough Mudder have teamed up for what will be the largest, testosterone-fueled, guys-only gay team ever to hit the muddiest obstacle course in the world. 10% of the after-tax profits from these events will be put towards saving lions in Africa from illegal trophy hunting and poaching.